Egyptologists to understand most of the ancient Egyptian artifacts only with their conscious mind. Our modern mental structure bars us from entering and comprehending the logic of ancient peoples. how can one fully understand what one has never experienced? the world around them differently. 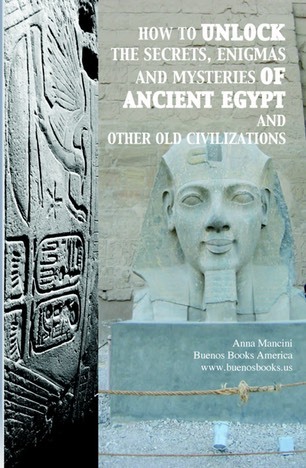 people who endeavor to advance our understanding of the ancient Egyptian civilization and of other ancient worlds. Anna MANCINI, Ph. D, is a specialist in intellectual property laws and Internet law and has published several books on these subjects. She has worked with a patent firm in Paris and media companies in Brussesl and taught at university level. 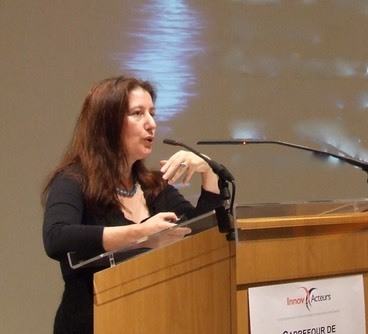 She is the founder of Innovative Justice, a Paris-based research organization on the modernization of law, created in 1994. The French version of this book received a grant from the French Centre National du Livre (NationalCenter of Books). Taranto, a south Italian city, was founded around 706 A. D. by a Greek Spartan colony. However, modern visitors to the city will only find two temple columns remaining from the ancient Greek temple that was once erected in this beautiful site, facing the deep blue of the ocean. My parents lived in the former sacred area of this old temple. It is there that I was conceived a short time before they left their country for France, where I was born. Even though modern psychology has evidenced the reality of psychic transgenerational heredity, the facts that I was conceived in this ancient place and am a descendant of remote Greek ancestors were not enough to help me gain a better understanding of the ancient Mediterranean civilizations. Other sets of circumstances were required. The first was brought to me by my parents. My father was a "normal" man for his time. He was rational and logical. He was literate and could quickly adapt to the culture and language of his new adoptive country. The mental structure of my mother was thoroughly different. Due to a significant hearing impairment, my mother could not go to school and was illiterate. Because of these circumstances, her mind remained almost untouched by the influences of the modern world. She grew up in a different world--a world created mainly from images, physical sensations, and intuitions, where reading and writing were absent. She used her brain differently and developed an unusual kind of intelligence that gave little room for our much valued modern rationality and no room at all for our abstractions. My mother's mental structure was more similar to those of ancient peoples who were considered to have pre-logical minds. Later in my life, I understood that my mother had been an open book for me on the mental universe of ancient Mediterranean peoples and that she had prepared me to better understand the laws and the minds of the ancient civilizations that I was to study at the university. My father spoke Italian and French, but my mother only spoke the old Taranto's dialect. It was this old language full of images that became my mother tongue. Later on, in the course of studying archaic Roman law, the knowledge of this old language helped me a great deal. However, before arriving at this stage in my life, I had to go through a long patient route in my family life. My parents lived in two different and disconnected universes of thought. By observing them, I realized that they were both intelligent, but possessed different kinds of intelligence. My father and my mother enacted the encounter between ancient and modern worlds, between the logical modern universe and the pre-logical universe of older civilizations. Obviously, my mother was so lonely in her world. To help her, I began translating French newspapers, books, movies, and conversations for her, speaking as loud as I could. In my early childhood, I had developed French-Italian dialect interpretation skills, but more importantly (and more difficult), I had learned to translate things and concepts from our universe of thought into my mother's "pre-logical" universe of thought. In order to better communicate with her, I entered step-by-step into her world. There, I could discover a different rationality, another way to conceive time and space, a different approach to communicate with others, an intense dream activity, a vivid imagination, a powerful intuition and a strong sense of reality that I did not notice in other people around me. Little by little, I realized that my mother's brain was extremely active, giving her an intense "inner life" that filled her with a great joy that she passed to everybody around her. Many times, I noticed that what my mother said had to be "translated" into the language of our conscious mind in order to be properly understood. I had the clear feeling that my mother's psyche was tuned into life, energy, nature and the cosmos. It is this same "feeling" that I experienced later on in my life when I visited museums of antiquity. My father's psyche, to the contrary, was focused on the external world and the concerns of daily life. He had no interest in dreams and did not have the "antennas" which my mother strongly used in her life and which she used one day to save my life. Thanks to my father, and then thanks to the schools of Cartesian France, I developed my "modern" mind. At the same time, through my mother, I learned to communicate with my own inner pre-logical world or the ancient layers of my psyche that are richly alive during the dream process but unconscious for the most part during my waking state. My mother taught me how to use dreams to better manage my waking life. As I explored my inner world, I came to realize that our modern rational and logical mental universe is only a tiny iceberg floating over the immensely rich psychic ocean that was well-known to ancient civilizations. For most of us, this ocean does not exist. However at night, in our dreams, we all return to it. When I was twenty years old, I left my family in order to study the law at the University of Lille (North of France). I forgot my mother's world. For the study of law I had no need of imagination, dreams, intuition, and the pre-logical way of thinking. My old dialect was useless, too. Who would speak this language there? Nobody. I was studying civil law and planning to become a barrister and a professor of law. My cultural heritage took me to a completely different destiny. My second encounter with the ancient worlds took place in my fourth year of studies. All of this began with the choice to study Roman law. It was an optional matter and I enrolled in it, following my intuition and not listening to my conscious mind telling me it would be useless for my career as a lawyer in business law. How gladly surprised I was to notice that in archaic Roman law the universe of thought was very similar to my mother's. This made me so happy and curious. I felt close to this ancient system and familiar with it. It was amazing that such an old legal system was still taught in universities and still fully alive through all the continental legal systems. Our professor of Roman law was a "celebrity" from the University of Paris. Each week he would come to Lille to share, with much enthusiasm and passion, his scholarly knowledge about Roman law. The knowledge he was passing to us taught me much more than what he could himself grasp, because I was much better trained than him to understand this ancient universe of thought. While this intelligent man laughed at these "primitive" people because he did not understand them, he was opening doors for me that had stayed perfectly closed to all the specialists that had approached the archaic Roman law with their modern minds. I understood that this "law" was, in fact, an unexplored source of knowledge about the intangible world and about the human brain. Thanks to my different approach to Roman law and my dream ability, later, during my doctoral research at the University of Paris, I was glad to bring to the academic circle (in its language) the solution to the famous enigma of ancient Roman law, which was called the enigma of rights. This issue gave place to abundant research and jurisprudence, which lead to nowhere to such an extent that after several centuries of research performed by the most eminent European scholars, it was decided to abandon this fruitless quest. This discovery did not please my thesis supervisor, a powerful member of the University of Paris and a French academician. He did everything he could to block the circulation of my work and barred me from the university. When this man retired from the university, I returned for a second thesis about the philosophy of Internet law under the direction of a friendly Greek philosopher. Surprisingly, these new researches lead me to my third encounter with ancient civilizations. This time it was ancient Egypt. How did Internet law bring me to ancient Egypt? The fact is that I had realized that the Aristotelian concept of justice (and its derived modern versions) was conceived for a tangible world but was useless within the Internet. As I researched a concept of justice that would be suited to the Internet (an intangible world), I found books and articles about Maat, the ancient Egyptian concept of justice. Between my two doctoral theses ten years had elapsed, during which I had gone to the University of London where I studied the philosophy of the mind. During this time, I had also founded Innovative You, a Paris-based research organization on the functioning of the creative mind. I created this organization because as I was working as a lawyer in the field of patent law, I met many inventors who dreamed their innovative ideas and I wanted to understand this phenomenon in order to provoke it at will, instead of waiting for its random occurrence. In the frame of this organization I performed a lot of experiments, deepened my research on the mind, and taught many people. From this work resulted the invention of a method that I still teach today to people wanting to access and use their unconscious intelligence. This method also allows one to be in touch again with the ancient layers of our psyche, which helps to better understand how our remote ancestors perceived the world surrounding them.